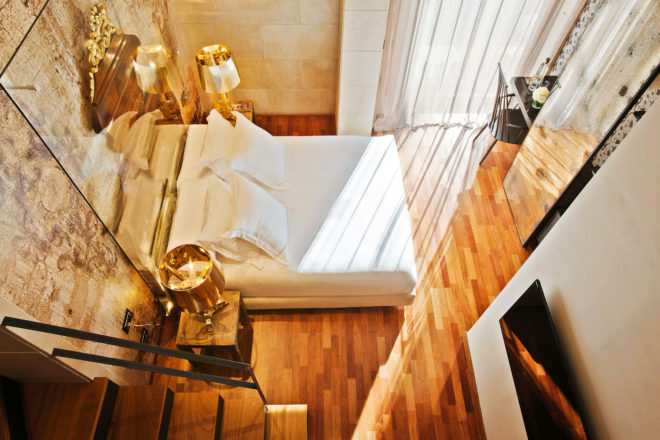 No two rooms are alike at Hotel Claris; this shot shows the Junior Duplex Suite with warm tones of copper, wood, cement and glass. The modern and sleek lobby area of Hotel Claris. Hotel Claris occupies the Palacio Vedruna, a former palace that dates back to 1892. 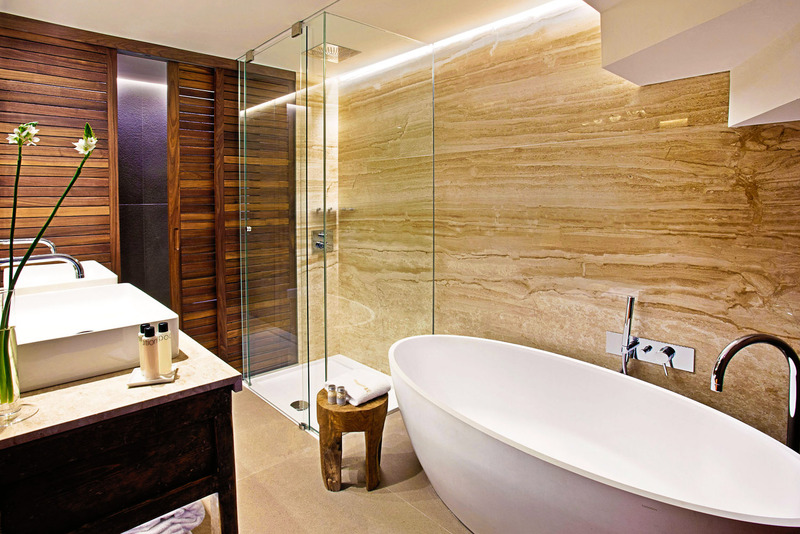 Like a private Japanese onsen, this guest bathroom features a walk-in shower and a bath worth sinking into. Barcelona is an interesting proposition: a city that everybody raves about for its myriad architectural wonders (many contributed by the visionary Antoni Gaudí) the hospitality of its gregarious Catalonian locals, the food (Catalan crème brûlée is reason enough to go, let me assure you), the climate… You name it and Barcelona apparently has it in spades. All except one thing: hotels. I mean, they have hotels obviously, just not as many of the big names as you might expect. But what it lacks in international brands it makes up for in small, interesting boutique hotels like Hotel Claris. Part of the Derby Hotels Collection of boutique hotels owned by developer, collector and scholar Jordi Clos, Hotel Claris is one of those little gems that you can’t help but congratulate yourself on finding. Housed in the Palacio Vedruna, a former palace, and located a block from the wide thoroughfare of Passeig de Gràcia, with its luxury shopping and Gaudí landmarks such as Casa Batlló (it’s pronounced Bay-o, just so you don’t go around embarrassing yourself by pronouncing it phonetically – not much is pronounced phonetically in Catalonia), the cosy service is the first thing that distinguishes Hotel Claris. A smiling liveried doorman is ready to help with your bags, with an accommodating reception staff ready to please (I had arranged for train tickets to be delivered ahead of our arrival and they were passed on promptly). The sun-drenched reception/lobby area is a hybrid of funky lounge, with its leather egg chairs and wide sofas, and gallery showcasing Clos’ impressive collection of antiquities such as Roman mosaic and Greek statues (there’s a small museum on the first floor with a stylish arrangement of 70 Egyptian artefacts, but the bulk of his collection can be found down the road at the Egyptian Museum of Barcelona). Our room card is delivered with a handy list of safety tips warning against things like walking down dark alleyways alone in the Gothic Quarter late at night and advising to keep our valuables close at hand when out and about (Barcelona has a reputation as a pickpocket and petty crime haven, but I never felt a moment of anxiety during our stay in the city), and a free pass to the aforementioned Egyptian museum. We are directed to the glass elevator, which looks out onto a light well that sits in the middle of the building complete with giant leaf sculptures and a koi pool. On the second floor, our Junior Duplex Suite is divine, with its pillow-laden king bed, rustic Chinese furniture in lieu of the usual hotel fittings and a giant birdcage that provided hours of make-believe entertainment for my daughter. The bathroom is generous in size and luxe in execution, and up a winding wood and metal staircase is a large loft sitting room with a throw-yourself-down over-stuffed sofa, more Chinese pieces and a tapestry on the wall. The whole effect is airy, roomy and very chic. Each of the 124 rooms and suites is decorated with the same attention-to-design detail and one-of-a-kind artworks. There are two dining options to choose from – downstairs East 47 Cocktail & Tapas Bar is a riot of bright colour and pop art, with an impressively comprehensive cocktail and spirits menu and tapas plates for $7–8. Upstairs, meanwhile, is the real star: La Terraza del Claris, a rooftop glasshouse restaurant with views across the city and a menu stacked with Mediterranean flavours. There’s bar service up here too, where drinks can be quaffed on the open-air pool deck on balmy nights, with a DJ on the weekends. The surrounding neighbourhood of Eixample offers up plenty of dining options, too, if you fancy venturing further afield for something to eat. Directly across the road is Joséphine Barcelona, with its handsome black-tied waiters, late opening and hipster crowd. And a short walk away we found Café Emma, open early for breakfast and serving the very European option of crusty bread, butter so good you will want to slice it instead of spread it, and strong coffee. Back in our room after a late-afternoon swim in the rooftop pool and dinner at a nearby tapas restaurant, languishing in the luxury of good design (it’s a member of Design Hotels, after all), with an antiquity or two on the walls, big names suddenly hold very little appeal. 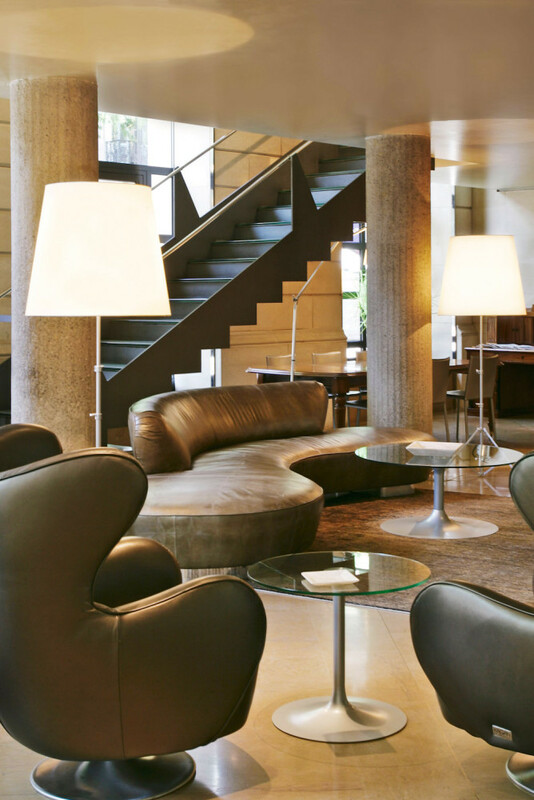 With its gorgeous design, attentive staff and the best of Barcelona just a walk away, Hotel Claris really is one of those places that you feel lucky to have discovered. Perfectly located away from the overt hustle and bustle of the tourist trails but close enough to easily access them. Stylish with a capital S, with its beautifully considered interiors and generous use of antiques. The service is unobtrusive but always attentive, and there’s no too-cool-for-school attitudes, which sometimes come with the boutique tag – just warm smiles. If I could replicate the look at home I would in a heartbeat but I would be a few antiquities short of the full scheme. The rooftop restaurant is buzzy all day, with ladies who lunch making the most of the alfresco vibe and views, and the room service is always prompt and beautifully presented. We paid $314 for our Junior Suite Duplex. 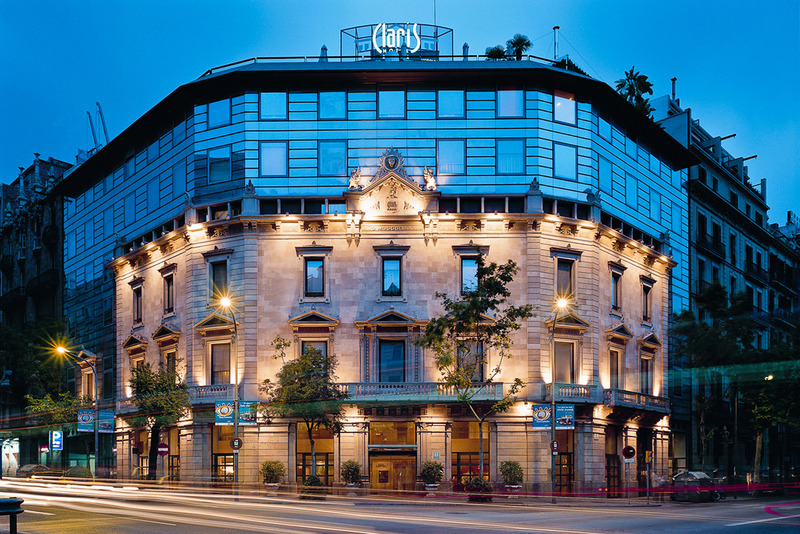 Spain’s economic woes make Hotel Claris extremely affordable, especially considering the quality of the fit-out and the attentive service.